I’m not sure if you’ve noticed but I start every blog post with the day and EXACT time I start typing my message to you. Sometimes I wonder if that hurts my SEO results. Google’s artificial intelligence programs are smart enough to know where my actual content starts, right? If not… Google’s A.I. must be pretty damn stupid… and we know it’s not. I do a few other things on my blog SEO experts say are wrong. There’s a method to my madness… and we’ll talk about that in more detail another day. Basically, it’s an affront to my creative integrity to write solely for SEO. You see, I started writing and CONTINUE to write this blog exclusively for you, the end user, to use a very impersonal Google term. And that “keep the end user happy” is the EXACT formula Google adheres to with all their various services, including the 800 lb. gorilla Google search engine. If that philosophy hurts my SEO… so be it. I didn’t start doing this blog for SEO and I’m not going to compromise my beliefs just to get better search engine positioning. Hell, I’m a frickin’ marketing expert for crying out loud. I’ve generated MILLIONS of dollars with an initial investment of only $200. If all I cared about was traffic, I could throw so much targeted PAID traffic at this humble little blog, it would make your head spin. But that’s not why I’m doing this. 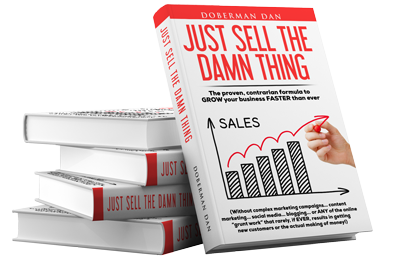 My initial stated goal for DobermanDan.com was to make a difference in your life and share many of my “school of hard knocks” lessons with you… so you don’t have to suffer like I did trying to figure out all this stuff. I’m not going to compromise my goal, edit myself, choke off my creativity and restrict my muse to a certain number of words just to please the search engine gods. Look… I have enough life experience to know that any time I compromise myself… or edit myself in any way to please some external force… my message gets watered down… and YOU my dear reader, are the one who gets short changed. for better search engine positioning! 2. I have the hope you’re perceptive enough to notice the widely varying times at the top of each post… and… the smarts to learn a valuable lesson from it. I recently made a new commitment to myself… and, indirectly, YOU. I realized I’ve been investing most of my time in my cherished Marketing Camelot members and paper & ink newsletter… but I’ve been ignoring my blog. So I committed to writing a blog post every day for a certain period of time. I appreciate you following my blog and I sincerely want to provide value in your life. From a purely financial standpoint, all this extra time invested in writing these daily blog posts is a piss-poor investment of my time. I could make a LOT of money investing this time in my various business ventures. Anyhoo… back to the “date & time thang” on my blog posts we originally started talking about. If you’ll take the time to notice, I start writing my blog posts at widely varying times. Sometimes [4:00] AM… sometimes [11:57] at night… other times [1:00] PM in the afternoon. Basically, I write you at all times of the day and night. For example, it’s now [8:44] PM Sunday night. An hour has passed since I started writing to you. I’m SUPPOSED to be taking the night off… and this evening was supposed to be spent relaxing with the Colombiana watching movies. Instead, I’m spending the evening writing YOU… with the glimmer of hope something I say will help you avoid many of the mistakes and much of the misery I’ve experienced. Well, for one thing, I sincerely hope you’ll follow my lead. …whether or not there is an immediate reward. The financial reality is… I will probably make ZERO cashola from all the time I invested in this blog post. I didn’t invest my valuable and limited life in this post solely for money. 2. To experience the personal satisfaction of keeping my word to myself and completing my work. If I make a few bucks because you FINALLY wise up and subscribe to The Doberman Dan Letter… that’s just gravy. I’ve already received my reward in full… because I did the work. Wanna feel good about yourself every single day? Commit a minimum of 33 minutes and 33 seconds every single day to doing the work needed to reach your goals… and miracles will start to happen in your life. P.S. It’s now [10:53] PM Sunday night and I’ve finally finished writing and editing this post. Three hours and 10 minutes invested in YOU… on my only “night off” this week.